The Catholic church in India criticized growing intolerance and mob violence targeting religious minorities over cow protection. “The vast majority of the people of India of all communities (have) been shocked at the lynching in various states on the pretext of protecting cows,” said a statement issued by the Catholic Bishops’ Conference of India after a 16 July meeting in New Delhi. About 40 religious leaders — Christians along with Baha’i, Hindu, Muslim and Sikh — attended the meeting. Some Hindus worship the cow as a goddess and oppose slaughter of cows, with some states even running care centers for cows. In a June report, The Times of India said that since 2014, when the Hindu nationalist Bharatiya Janata Party came to power, vigilantes had killed at least 32 Muslims. It said that in most of these attacks, the premise had been allegations of cow slaughter, smuggling, eating or even possessing beef. Mobs have killed meat and cattle traders in the name of protecting the sacred cow. “We are going through difficult times. What we see on the TV (lynching) is frightening,” Auxiliary Bishop Theodore Mascarenhas of Ranchi, secretary-general of the Catholic Bishops’ Conference of India, told Catholic News Service 18 July. “Hatred is being spread, and attempts are being made to divide the people. We want to create harmony by bringing people of all faiths together,” he said. At the end of the assembly of the Kerala Catholic Bishops’ Council 8 June, Archbishop Maria Soosa Pakiam of Trivandrum criticized the federal government’s move to curb cattle trade in states like Kerala, where beef eating has no cultural inhibition, even among majority Hindus. “We will never accept a dictum on what we should eat or do,” Archbishop Soosa Pakiam said. In one of the large, bright rooms, children stand behind easels, refining pencil sketches and proudly presenting their masterpieces. The teacher, Vanush Safaryan, is a member of the Painters’ Union of Armenia and a former director of an art school in Artashat. He teaches children not only the craft of drawing and painting, but also the history and appreciation of art more generally. “Art will save the country,” he says of a country that savors its rich art and architectural heritage. “Let them love the art. Twenty of the children have already chosen this path, so it is already a victory,” he adds. The center’s smallest pupil is a 9-year-old named David. David has drawn a picture of construction site, with a worker seated inside a crane and a still-unfinished building nearby. David lives with his parents and a younger sister in a rented apartment in poor condition. The center offers him an escape, and a sense of hope. “After school we come here,” he says. “We have dinner, then we play games, draw, do our homework. It is very good.” He stops talking so he can focus on bringing his sketched construction site to life. Read more in ‘This Is the Only Light’ in the June 2017 edition of ONE. Editor’s note: CNEWA donor Dan Searby had a chance to visit Lebanon this spring and see some of CNEWA’s work in the region. He sent us his impressions from the trip, below. After a spring 2011 pilgrimage to the Holy Land, I found myself especially drawn to the faith keeping Christians in the region, the “living stones” who are often overlooked as one tours the holy sites and historical landmarks. Msgr. Peter Vaccari, now rector of St. Joseph’s Seminary in Dunwoodie, New York, subsequently introduced me to CNEWA and its work supporting the church and Christians in the Middle East. Today CNEWA’s work is more vital than ever and the persecution of Christians in the Middle East has created what Pope Francis recently called “ecumenism of blood.” I wonder if there is a not a silver lining or even a divine design in what is taking place in the region, and that this can all become a force for Christian unity. I believe that CNEWA is uniquely positioned to play a leading role toward this great end. The intervening years have deepened my relationship with CNEWA and last summer I returned to Israel and Palestine for a “Year of Mercy” pilgrimage led by Msgr. Vaccari. Beyond the rich spiritual experience, the journey included a fascinating briefing by CNEWA’s regional director in Jerusalem, Sami El-Yousef. Before traveling to Israel, we had spent three days in Rome and on our first stop, at “St. Paul’s Outside the Walls,” we encountered a large group of Lebanese pilgrims. I was struck by their faith journey, and could not imagine the trials they had been through in their native land. I had always dreamed of visiting Lebanon, which is celebrated in the Bible for its beauty, snow-capped mountains, wine and especially Lebanon’s legendary cedars. Largely through a CNEWA-facilitated correspondence with the Beirut regional director, Michel Constantin, this year I was able to plan out a trip to Lebanon in April, and a visit to Mar Doumit, a convent-run school on Mount Lebanon, outside of Beirut. With Michel out of town, I was met at the airport by his deputy, Kamal Abdel Nour. After navigating Beirut’s notoriously chaotic traffic, we snaked our way up Mount Lebanon and arrived at Mar Doumit. I was familiar with the school. Last year, right around Christmas, a group of us had supported a call to raise funds for Mar Doumit, to help equip the school with special needs educational materials. When we arrived for our visit, we were met at the school by its headmistress, Sister Juliette. Sister Juliette gathered about half a dozen of her teachers and we sat down and enjoyed coffee, tea and a most generous spread of Lebanese sweets. A group of students took us to the school, which we toured as they demonstrated the new educational materials, including electronic tablets that had just arrived. The dedication of the teachers and the youthful zeal of the students were most stirring. The visit also helped us see in a very personal way the impact of CNEWA’s work. Finally, while we often hear the phrase “boots on the ground,” I saw the CNEWA equivalent of “sandals on the ground” in Sister Juliette — one of many heroic sisters in the region who teach, heal, comfort and serve as good shepherds and keepers of the faith. Dan Searby and Sister Juliette pause for a picture with some of the students of Mar Doumit. A member of the Iraqi federal police walks along destroyed buildings from clashes in Mosul 10 July. When I arrived to Zahleh on my reporting trip, I expected to hear the same resentful discourse toward Syrian refugees that I hear all over Lebanon. With refugees constituting more than one fourth of the Lebanese population, the public outcry over this irregular situation — one that has been continuing for several years now — is palpable everywhere. In this pretty Christian town, people I talked to speak mainly of a stagnant economy and say that with refugees willing to earn very little, competition over jobs has been fierce. You see the impact everywhere. As in the central streets of Beirut, Syrian children, sometimes as young as five, beg on the streets. When I stopped for coffee at a random café, the waiter was expectedly Syrian. His story was one I had heard many times over. In Syria, he was a university student but because of the war, he had to abandon his studies and his country. So when I finally met Eli and Lina, my encounter with the couple was heartwarming. Eli is a struggling Lebanese technician who supports his aging mother, Aida. Lina is a Syrian refugee who fled with her family from the bombing of her hometown in Syria. A couple of years ago, they met at a clothing shop in Zahleh and swiftly fell in love with each other. Today, they are married and have a child, Michael. It was delightful to see that, despite the surge in racism against the Syrians among the Lebanese, love between people from these two neighboring countries was still possible. Relations between Lebanon and Syria have traditionally been very complicated. During the Lebanese 1975-1990 civil war, Syria was heavily involved in the conflict. People in Zahleh in particular still harbor animus feelings towards Syria because their city was placed under siege for weeks by the Syrian army during that period. It is true that since then, the proximity of Zahleh to the Syrian border has turned Syria into a vital trade partner and calmed the minds. But the conflict in Syria has strangled the city’s economy. And with the influx of Syrian refugees, relations between the two cultures entered a complicated new phase. When I asked Eli and Lina if they heard disapproving comments from friends or neighbors about their marriage, they simply shrugged their shoulders. To them, their love story came about naturally. On my second visit to their modest home, I saw on the wall an assemblage of their photos in a frame decorated with hearts and the word, love. They looked like a happy young couple in the photos. I asked Lina about the new frame. She smiled and said it was a gift from Eli for Valentine’s Day. Like all parents, Lina and Eli worry mostly about the future of their child. The brunt of the devastating war in Syria is still present, But, as Lina explained, the only focus today is on how to provide the best education for Michael, who is set to enter school next year. Life, she said, goes on. 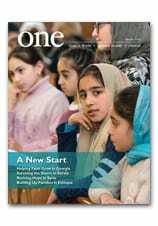 Read more about Hardship and Hospitality in Lebanon in the June 2017 edition of ONE. And meet Eli and Lina in the video below.